Essential fatty acids (EFAs) are naturally occurring fats that our bodies cannot produce. Instead, they must come from whole food sources or supplements. EFAs are critical to help dampen inflammation and autoimmunity, promote blood vessel health, support healthy skin growth, give the hormones the precursors they need to remain balanced, and support healthy brain and nervous system function. It is estimated that up to 80 percent of the U.S. population fails to get enough EFAs each day, thanks to our modern, overly processed diets filled with industrial fats. To make matters worse, hydrogenated and trans fats in processed foods impede the body’s ability to properly metabolize EFAs and anti-inflammatory good fats can be converted into inflammatory ones. As a result, one becomes even more deficient in EFAs. A whole foods diet that includes healthy fats is vital to brain, immune, and hormone health. Eating the appropriate fats is vital for good brain health. For instance, 60 percent of the brain is made of fat and the fats you eat affect the composition of your brain. If you eat high amounts of processed oils or partially hydrogenated fats found in boxed and bagged foods and at many restaurants, particularly fast food restaurants, the membranes of your neurons lose their fluidity and flexibility and become less efficient at their functions. EFAs are also necessary to prevent inflammation from getting out of control, support healthy hormone function, maintain cardiovascular health, and more. Healthy communication between neurons in the brain means better brain function, mood, memory, and overall health. Your diet must be high in the good fats that support brain function and general health and low in fats that impair brain function and promote degeneration. It is important that your diet contains the correct ratios of different EFAs. Americans need to be most cognizant of omega-3 fatty acid, found in cold-water fish such as salmon, sardines, herring, mackerel, black cod, and bluefish. These sources contain the two most critical forms of omega-3 fatty acids, eicosapentaenoic acid (EPA) and docosahexaenoic acid (DHA). DHA is vital to brain function, taming brain inflammation and preventing degeneration. Vegetarian omega-3s contain alpha-linolenic acid (ALA), which the body may convert to EPA and DHA. Dietary sources include walnuts and flax seed. However, many people have trouble converting ALAs to beneficial forms of omega-3, particularly if insulin resistance is an issue. Eating a diet high in omega-6 fats may also hinder this conversion. The typical American diet does not contain many sources of omega-3 fatty acids, while it is over abundant in omega-6 fatty acids found in processed, snack, and restaurant foods that use industrial and vegetable oils. High levels of omega-6 fats offsets the benefits of omega-3s. This explains why omega-3 deficiencies and imbalances are so rampant. Our hunter-gatherer ancestors ate about a one-to-one, or 1:1, ratio of omega-6 fats as omega-3. Today the average American eats a ratio of as high as 25:1 — way too many omega-6 fats compared to omega-3 fats. This is due largely to sunflower, cottonseed, soybean, sesame, and canola oils in processed foods. This extreme imbalance between omega-6 and omega-3 creates a very inflammatory environment that plays a role in many chronic conditions, including heart disease, diabetes, autoimmune disease, and conditions that degenerate the brain. The way to prevent this inflammatory environment is to increase your consumption of omega-3 fats and lower consumption of omega-6. Researchers recommend a ratio of omega-6 to omega-3 that ranges from 1:1 to 4:1 for optimal health and prevention of disease. Heat is the enemy of EFAs because it changes their structure so they are less nutritious. For example, olive oil that is not heated is more nutritionally supportive than heated olive oil used for cooking. Raw fish has more usable essential fatty acids than cooked fish, and foods such as fried fish sticks offer very little in the way of essential fatty acids. Nuts that are dry-roasted or treated with heat for flavoring end up losing their essential fatty acid levels. When animals are raised on grass they produce meat and eggs with a much higher concentration of omega-3 than animals confined and fed only grain or pastured then finished on grain. Eggs from pastured hens have an omega-3 content higher than factory-farmed eggs. Grass-fed meat has two to four times more omega-3 than grain-fed meat. It is also higher in vitamins A and E, antioxidants, and conjugated linoleic acid, which has cancer fighting properties. One study showed subjects who ate grass-fed meats showed higher blood levels of omega-3 than those who ate grain-fed meats. Some cattle are raised on pasture but then finished on grain, which lowers the omega-3 profile, so it’s important to look for meats that are not only grass-fed, but pasture-finished. However, although grass-fed beef is a better option compared to grain-fed, don’t be fooled into thinking it’s a substitute for cold water fish. Salmon has 35 times more omega-3 than beef. 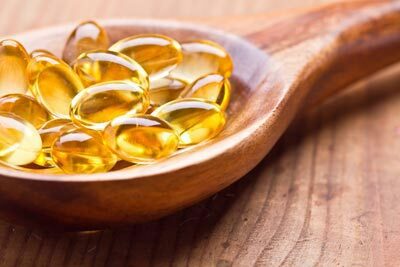 You can find a variety of EFA supplements, including flax seed oil, fish oil, olive oil, evening primrose oil, and emu oil, but fish oil is one of the richer and most studied when it comes to omega-3. How much fish oil you should take depends on your diet, but the dosage recommendations continue to increase with every new research paper published (probably because Americans continue to eat more poorly and become less healthy). Most people do not have to worry about taking too much EFA unless they are on blood thinners such as Coumadin, because fish oils thin your blood. In fact, the blood thinning effect is one of the mechanisms by which EFAs reduce the risk of heart attack and stroke. While most people do not consume enough EFAs to support their heart, hormones, and brain, they also do not supplement with enough fish oil, especially if their diet is limited in essential fatty acids. A paper published in the American Journal of Clinical Nutrition found in the United States healthy dietary intake of omega-3 is 3500 mg for a person eating 2000 calories per day. So if you eat 3000 calories you should take at least 5250 mg of omega-3 oils daily. The average EFA capsule is only 1000 mg. That means if you are eating 3000 calories a day (the typical healthy calorie intake in the United States is 2000 to 3000 calories a day) you should take at least 5 to 6 capsules of fish oil a day to support cardiovascular and brain health and reduce the risk of disease. Fish oils contain EPA and DHA. Both are important for your health, but each has different functions in the body. Most fish oil supplements have a one-to-one ratio of DHA to EPA, both of which work to reduce inflammation and support the brain. However, it now appears EPA has more of an anti-inflammatory focus while DHA has the greatest effect on brain health. If your goal is mainly to dampen inflammation, then regular fish oil or a fish oil with concentrated EPA is appropriate. If your goal is to positively impact the chemical status of your brain, then consider a fish oil with a high concentration of DHA. I have found individuals with neurochemical imbalances such as depression, mood swings, bipolar reactions, or poor memory derive more benefit when ratios of DHA to EPA are greater than 1:1. I personally like to use ratios greater than 10:1 or 20:1 of DHA to EPA. Algal oil is another good source of DHA. DHA is one of the major building blocks of the brain and is an essential nutrient for brain health and function of the neurons. It has been shown to boost brain function, improve quality of life, reduce brain inflammation, reduce the incidence of neurodegenerative conditions, and improve both short-term and long-term memory. If you suffer from chronic systemic inflammation — body aches, joint pain, and swelling — then you will be better off with regular fish oils that contain more EPA. EPA reduces inflammation both in the body and brain and may offer better brain support if inflammation is the primary issue. For my patients with hypoglycemia I recommend a well-rounded EFA supplement that includes flax seed oil and evening primrose oil. For those with insulin resistance, I recommend a fish-oil based EFA supplement. Insulin resistance creates a condition in which the body cannot properly metabolize the EFAs in flax, borage, evening primrose, or black currant seed oils. In fact, it shunts these otherwise beneficial fatty acids into pro-inflammatory compounds. Also, because the EPA and DHA in fish oil helps receptor sites on cells become more sensitive to insulin, fish oil is a must-have for people with insulin resistance. Blood tests are available to determine EFA status. It’s important when working to establish the sufficiency and proper metabolism of EFAs to root out and resolve any source of inflammation in the body, including gut infections, food intolerances, and chronic virus infection. EFA status won’t improve without resolving the source of inflammation. To summarize, both EPA and DHA are beneficial for overall brain health, but there are times when a highly concentrated DHA supplement can dramatically improve brain function. If overall inflammation is a problem, consider a fish oil with a 1:1 ratio of EPA to DHA. If inflammation (pain, swelling, body aches) is under control and you want to support your brain, use a highly concentrated DHA supplement. Given how few omega-3 fatty acids the average American eats, it is a good idea to supplement with essential fatty acids to optimize brain and hormone health. Despite which supplement you use, limit your intake of fried foods, partially hydrogenated fats, and processed vegetable oils. Eat more cold water fish, olive oil, avocados, and raw nuts and seeds. If possible, obtain your meat and eggs from animals raised on pasture and grass-finished. 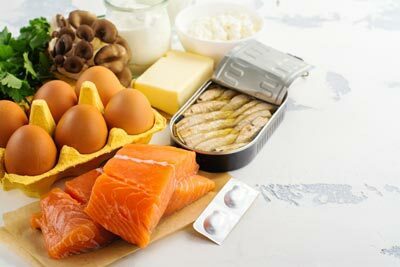 If your brain is not working well, it is very important to address intake of omega-3 and omega-6 fatty acids. For more detailed information about essential fatty acids, please see my brain book. Extremely thought-provoking article Dr K, thank you once again. I have a young adult client who for many years has been using a product with a 7:1 ratio of EPA to Dha, based on mood studies done over 10 years ago. It sounds as though newer research would indicate revisiting that ratio for this client, who could certainly use greater cognitive function and more emotional groundedness. Can you point us to the research that you’ve found compelling – or would you say these recommendations are based more on your own valuable clinical experiences? Also, do you have a recommendation for EFA testing? For another young adult client with Mast Cell Activation and Ehlers-Danlos Syndromes, I’m thinking EFA testing may be in order – though perhaps these two conditions suggest to you trying a certain ratio? Sorry, but Dr. Kharrazian is not available to consult on patient cases here on the blog, but I can offer you some information from his brain book. Simopoulos AP. The importance of the omega-6/omega-3 fatty acid ratio in cardiovascular disease and other chronic diseases. Exp Biol Med (Maywood). 2008 Jun;233(6):674-88. doi: 10.3181/0711-MR-311. Epub 2008 Apr 11. Review. PubMed PMID: 18408140. On page 403 he also mentions individuals with neurochemical imbalances such as depression, mood swings, bipolar reactions, or poor memory derive more benefit when ratios of DHA to EPA are greater than 1:1, and that he personally likes to use ratios greater than 10:1 or 20:1 of DHA to EPA. If you peruse the references for Chapter 19 of the book, there may be others of interest. Regarding your other two questions, if you want to email in your question to info@drkndews.com I can get you in touch with a private practitioner group that might be able to discuss those with you. Is there a ratio for DHA to EPA when using EFAs to decrease systemic inflammation? In his brain book, Dr. Kharrazian says it appears EPA has more of an anti-inflammatory focus while DHA has the greatest effect on brain health. If overall inflammation is a problem, consider a fish oil with a 1:1 ratio of EPA to DHA. If inflammation (pain, swelling, body aches) is under control and you want to support your brain, use a highly concentrated DHA supplement. If your goal is mainly to dampen inflammation, then regular fish oil or a fish oil with concentrated EPA is appropriate. However, if your goal is to positively impact the chemical status of your brain, then consider a fish oil with a high concentration of DHA. If you suffer from chronic systemic inflammation—body aches, joint pain, and swelling—then you will be better off with regular fish oils that contain more EPA. EPA reduces inflammation both in the body and brain and may offer better brain support if inflammation is the primary issue. He writes that individuals with neurochemical imbalances such as depression, mood swings, bipolar reactions, or poor memory derive more benefit when ratios of DHA to EPA are greater than 1:1. He personally like to use ratios greater than 10:1 or 20:1 of DHA to EPA. In Chapter 19 of his brain book () he goes into more depth on EFAs. Whitch ratio do you suggest? It sounds like you have issues with general inflammation as well as brain function. It may take some experimentation with different ratios of EPA to DHA to find what works for you. I’d read the summarized “EPA and DHA serve different functions” section of this article below then pick one to focus on first. Try that ratio for a few weeks, see how I feel, then if it’s not helping, change it to the other. “It appears EPA has more of an anti-inflammatory focus while DHA has the greatest effect on brain health. If your goal is mainly to dampen inflammation, then regular fish oil or a fish oil with concentrated EPA is appropriate. If your goal is to positively impact the chemical status of your brain, then consider a fish oil with a high concentration of DHA. I have found individuals with neurochemical imbalances such as depression, mood swings, bipolar reactions, or poor memory derive more benefit when ratios of DHA to EPA are greater than 1:1. I personally like to use ratios greater than 10:1 or 20:1 of DHA to EPA. Algal oil is another good source of DHA.